IBM® Operational Decision Management (ODM) is a family of products used by IT and business users to create and manage business decision logic throughout their organization. This IBM Redpaper™ publication offers advice on all aspects of performance, including hardware, architecture, authoring, quality of service, monitoring, and tuning. The advice is based upon preferred practices and experience gained from real customer situations. This paper is aimed at a wide ODM audience, including IBM employees and customers, and provides useful information to both new and experienced users. 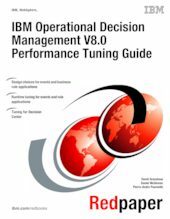 Although the product family is known as IBM WebSphere® Operational Decision Management (WODM), at V8.0, with V8.0.1 the the name is now simply IBM Operational Decision Manager (ODM). The performance information in this paper is based on V8.0 of this product family and differences introduced with V8.0.1 are pointed out.